Need ideas for your dining area? This collection of dining room designs will give you fresh ideas to brighten up and style this essential part of your home! The dining room is often a good place for the family to bond over. 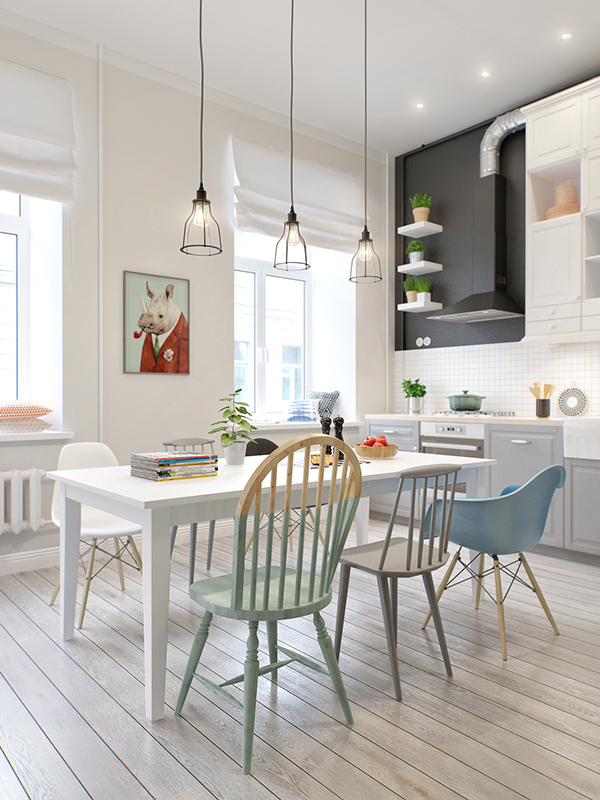 If you are thinking of building a home or renovating one, these Dining Room Designs For Your Home collection is a great place to get some interior design inspiration! Our dining room is a special place to bond over a good meal. It is where people are put at ease with the delicious food being served. Putting some effort to our dining room design is great as it is one of the most social areas in our homes – next to our living rooms, of course. 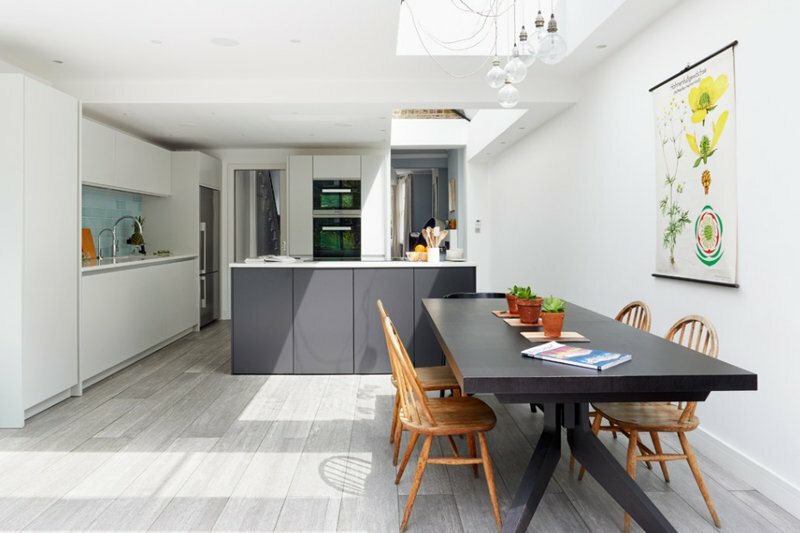 Having said that, we know that finding the perfect dining area design can be pretty tricky! We’re pretty sure you have some furniture and fixtures that you want to include. But how can you combine that and get lovely results? We might just help you with this cool and extensive collection that we have prepared for you. Grab that cup of coffee and take a look! Having a good dining area gives you the chance to provide a great place for family and friends to gather in dinner parties and other social events. Hence, you really would like to make your dining area a great place to stay. You want it to have a good design and style that will not only show your taste and personality but will also make it a comfortable place they will surely love. Your dining area is not merely a place for eating. It is one of the most important parts of the house where you can make memories. Your ambiance will surely contribute a lot to indulge your guests’ senses in munching on their favorite meals. Well, it is every homeowner’s dream to have a great dining area. To help you, we have here some tips that can serve as your guide in styling and designing your dining room. The first thing to know when you decide on the dining room design is deciding the kind of dining room you want. 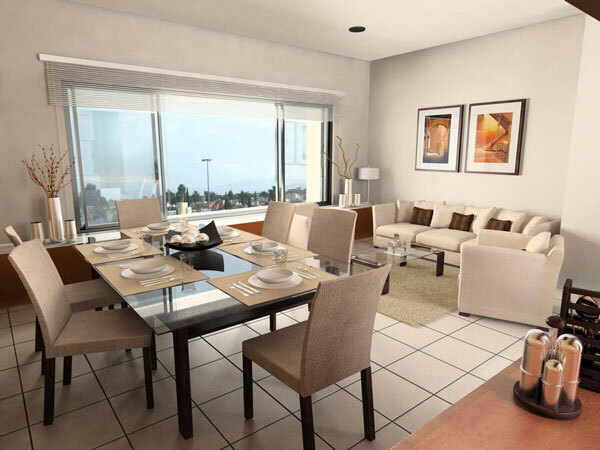 You might want a room for fine dining or just a simple dining area. Others even choose a simple bar only especially if the space is so limited. 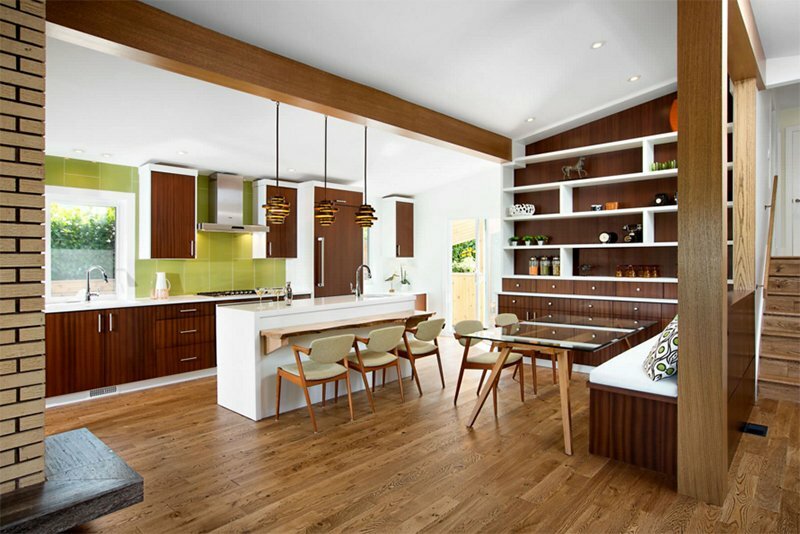 You wouldn’t be able to choose the right dining room design for your area if you haven’t decided what you want first. In designing your dining area, you have to know your style. 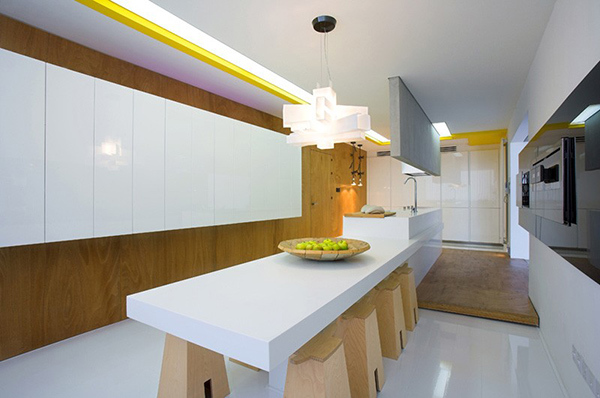 The design concept of your house should also be a concept in your dining area. If your interior is Eclectic, then everything should be Eclectic. There should be conformity for the rest of your home. 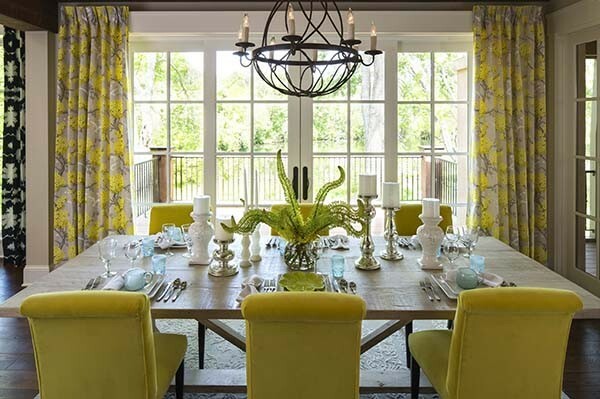 Another tip on dining room design is having smart colour choices. Make sure that you do not have mismatching of colour. You have to make up your mind in choosing the right colours. When mixing colours, make sure that they match and they are complementary. Avoid the use of loud colours in just one area. If you use bright pink, just accent it with neutrals and shades of pink. Do not use pink with green. See to it that the colours look good together. Your dining table is the star in your dining area. But it doesn’t really have to be new. If you think your old one will still look good and apt, then use it. You can also change its color if you want to. Choose the right size and shape of your table. If your area is small, you can use a round table. Your seats should be comfortable. It has to complement with your table, too. Space is very important in dining room design. First, you have to know if you have a wide or narrow space, a closed space or an open space. This way, you will be able to know the kind of colors to use. If your area is closed, you can choose colours that will make it look wide. It can also help you choose the right furniture sizes. 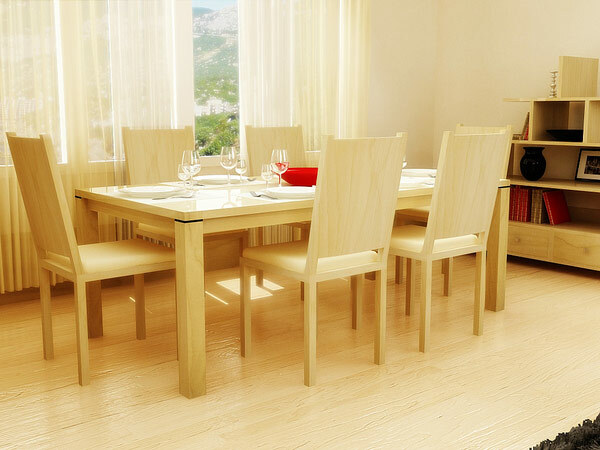 This will also be your guide in choosing the right layout for your dining room. In accordance with your space, make sure your arrangement is good that it won’t look so crowded and awkward. Your furniture and even decorative accessories in the dining area should work in harmony with each other. The right layout includes good traffic in the dining area. Make sure the homeowner and their guests will be comfortable in having meals in the place. Make sure that everything in your dining area has balance and harmony. You can use your old furniture if you want to. But if you think it doesn’t complement with the entire design, then you can buy a new one. 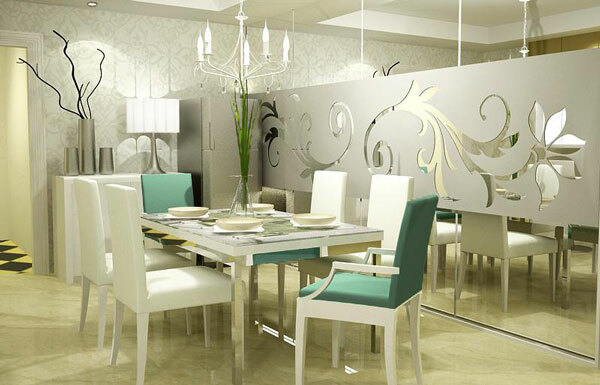 Your aim is to really make your dining area appealing, comfortable and distinct. Everything in the place should work well together. The choice of color, accessories, lighting and other aspects should look good as a whole. Most kitchens use a chandelier or an overhead light. This is a good focal point for your design. 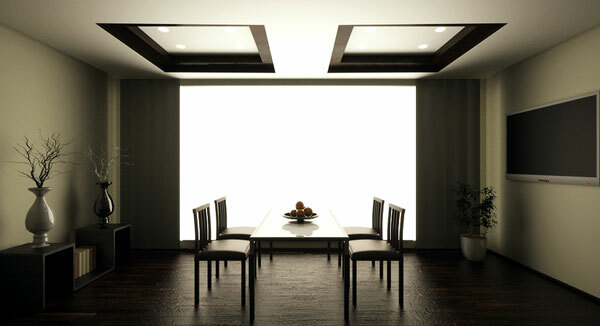 You may also use light with dimmers so that you can set the mood in your dining area. You can also use wall scones and pin lights if you want to. Others prefer to use some decor overhead the dining table. This is also good. You can also place some accessories in your dining area. If your place is small, put a large mirror or a painting on the wall to make it look bigger. Choose the kind of painting that will also go in harmony with the rest of the design. Accessories should be used subtly in this area. 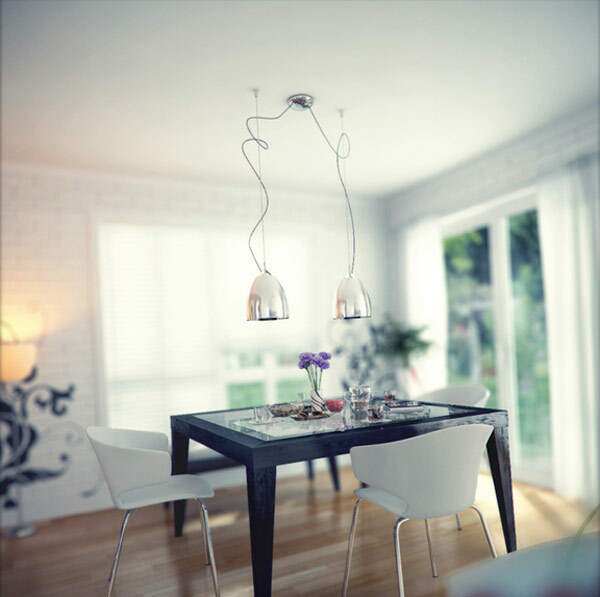 Add some sparkle in your dining area by placing accessories with glass elements. Have a good dining table setting. The dining room won’t be a dining room without a dining table. Consider the right size and type of the table. It is generally recommended to have a space of at least 36 inches between the edge of your table and other dining room furniture or the wall. Accessorize it in a manner that suits the design style of your room. You should have good table placement and a good centerpiece, too. Also, do not forget to choose the kind of tableware that will complement with the color and design. Yes, it is not impossible to create a dining room to bring family and friends together. You can all have a good time in an elegant and welcoming ambiance in your well-designed dining room. But before we finally end this, let me give you one last tip. Use wooden flooring, granite or ceramic tiles. Actually, what you used in your kitchen would be the same with the dining area for they are directly connected to each other. So, what are you waiting for? 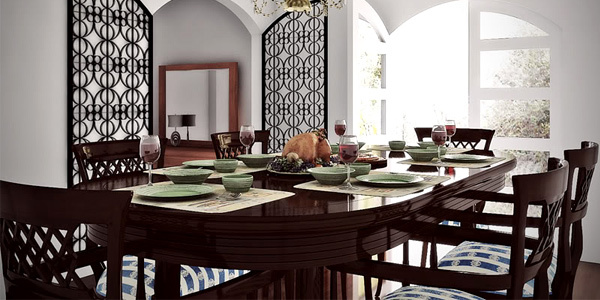 Plan your dining area that suits your style now! The dining room is where we get to enjoy a good conversation while getting our stomachs full of luscious meals. 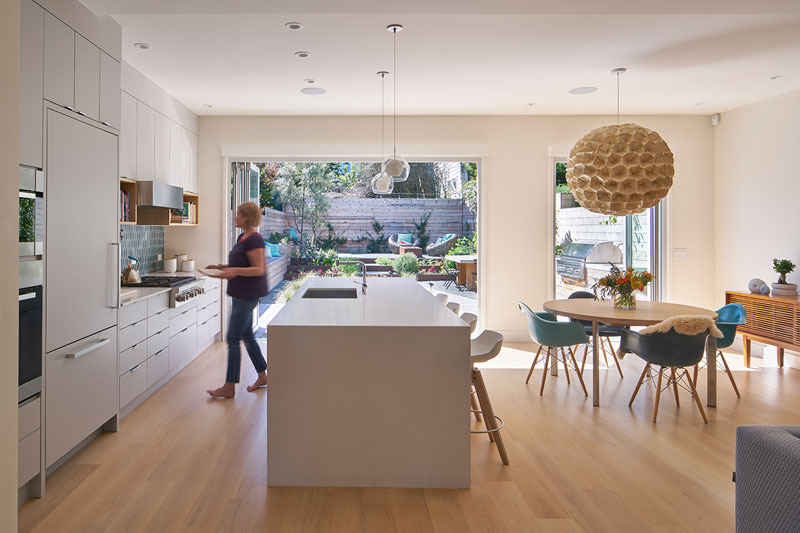 A dining room may be designed not necessarily for a whole lot. There are also those with limited space who’d want decent dining area and it is indeed achievable. In as much as there are dining areas for even two persons, we usually see those designed for quite a number of people. But no matter how many would sit and dine with you, it’s important to have the area conducive for dining. Want something modern for your dining rooms? Here are some great ideas for you. The black chairs are in dark contrast to the light interior. 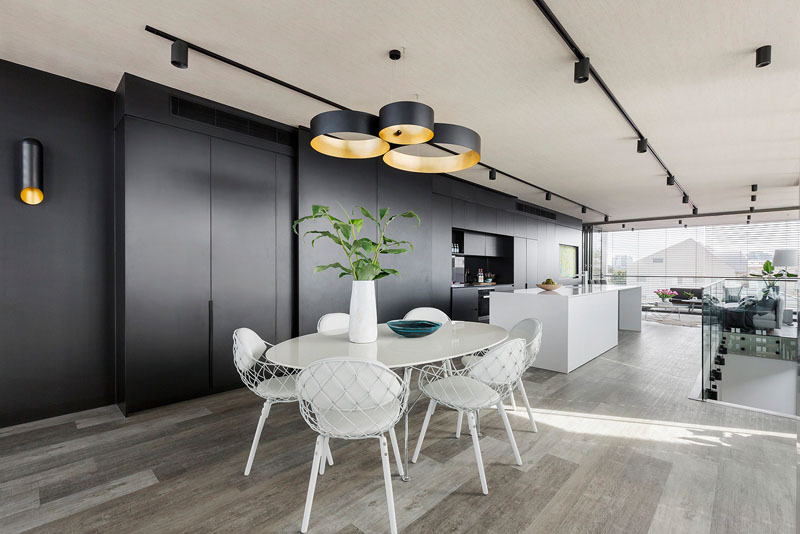 Its pretty chandelier adds a futuristic appeal to the dining area of the Middle Park House. 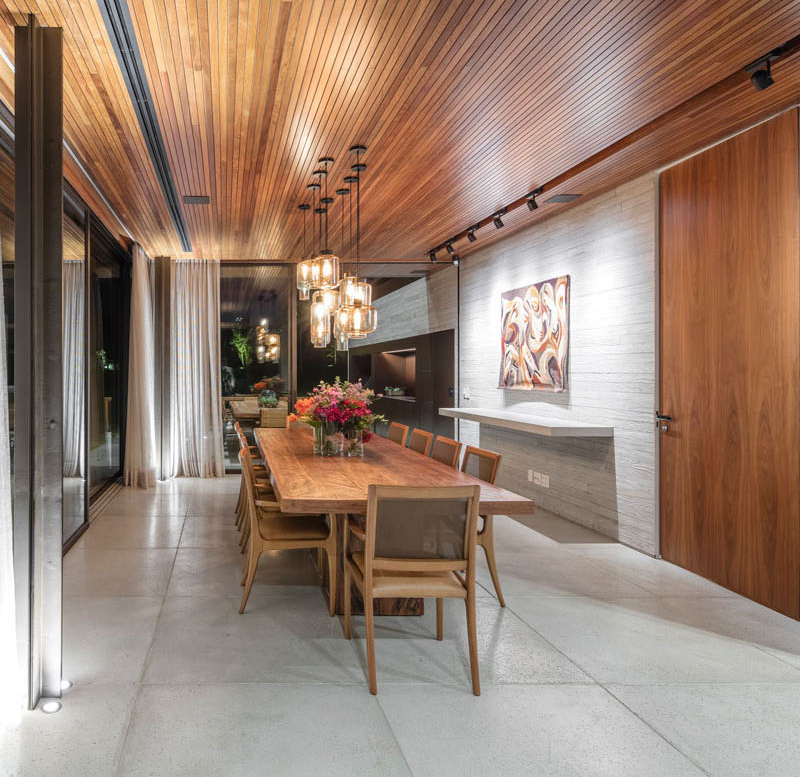 This elegant and modern dining room of Fazenda Boa Vista is quite pleasing to the eyes with the earth tones and white concrete. 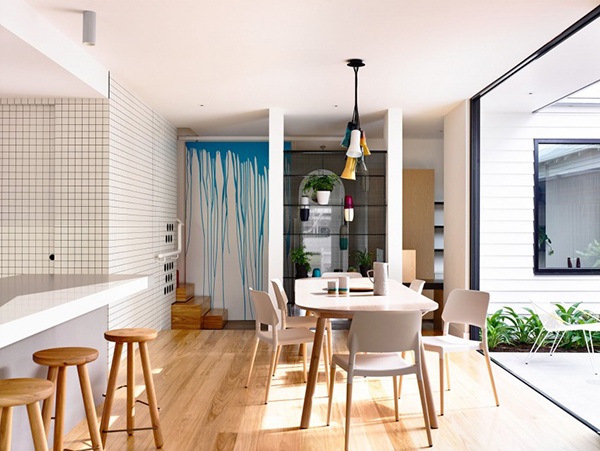 The cool white of the table and chairs add refreshing colour to this dining room at the Vista Prahran. Its unique light and cute chairs are very charming. Yaraville House‘ dining room is quite simple and modern. The woody accent of the table complements those of the room. 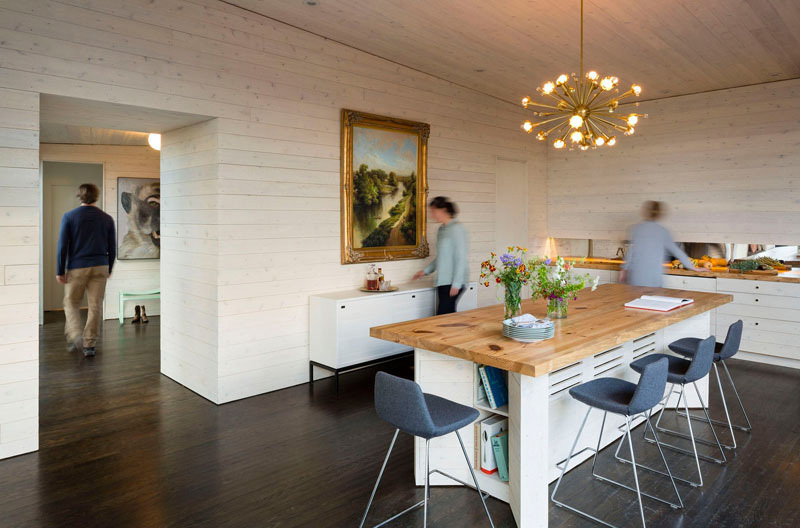 We rather like this dining room of the Du Tour Residence. 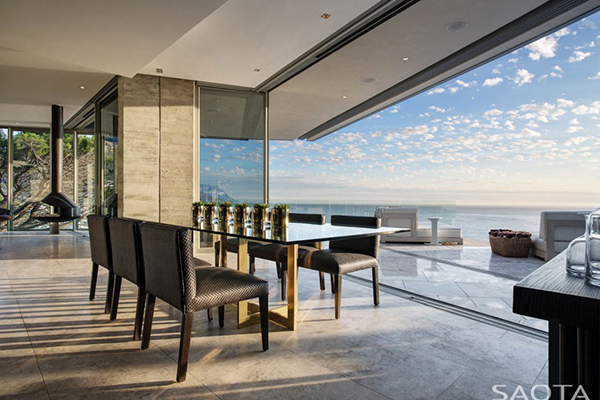 The dining area opens outside with a large black-framed glass door. The lantern-shaped lighting fixture at this home in Di Lido Island adds a nice character to the room as a whole. 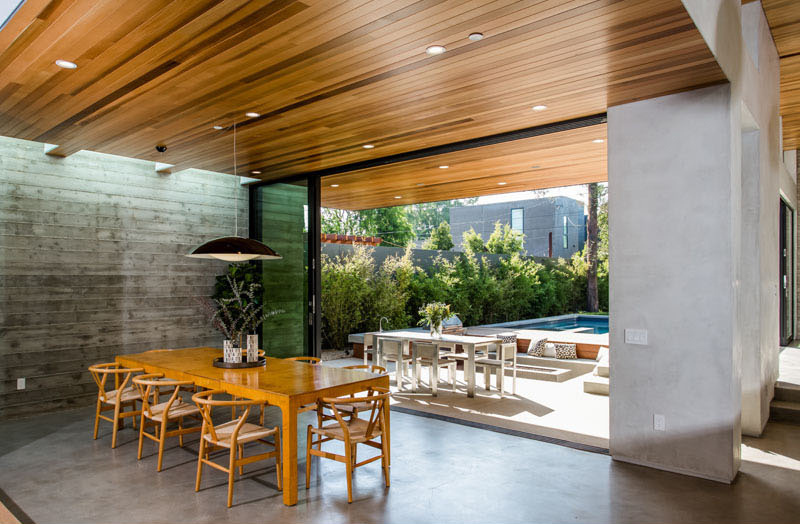 This dining area at the Redston Road Home looks very refreshing as it has open views to the backyard. The modern design of the dining room has a very charming effect. 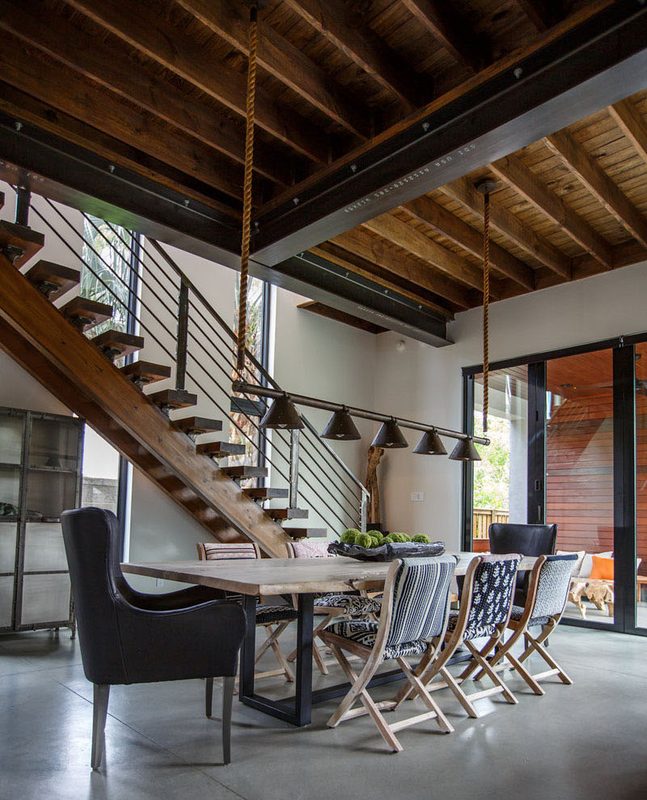 This is a renovated home that looks pretty awesome. 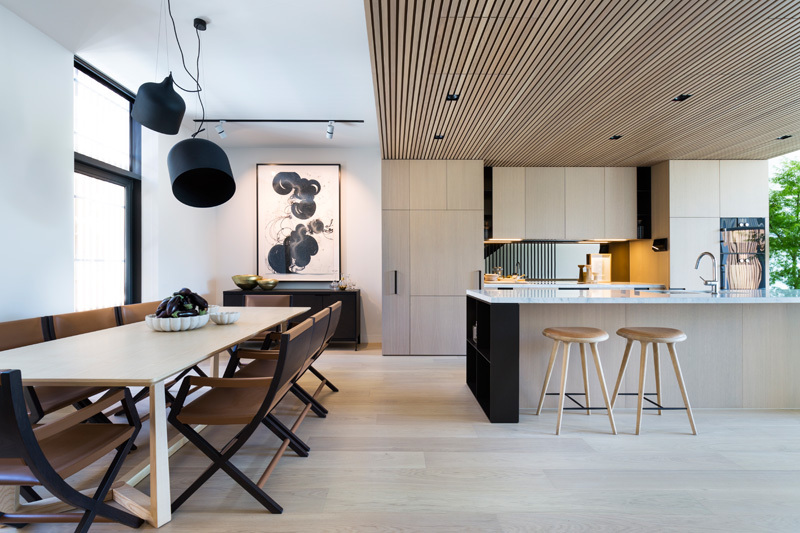 The lovely pendant lights are in perfect blend with hotel black chairs at this dining room in Toronto. There is a rather comfy look to the dining area. 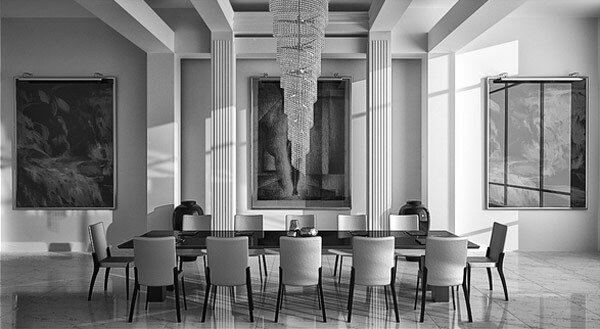 The dining room at 30 Esplanade is rather elegant with its black pendant light and unique dining chairs. The painting at the far end of the room adds a unique look too. The dining room at this B House is simple yet unique. The table has a pretty charming look to it and is complemented with the grey and white chairs. 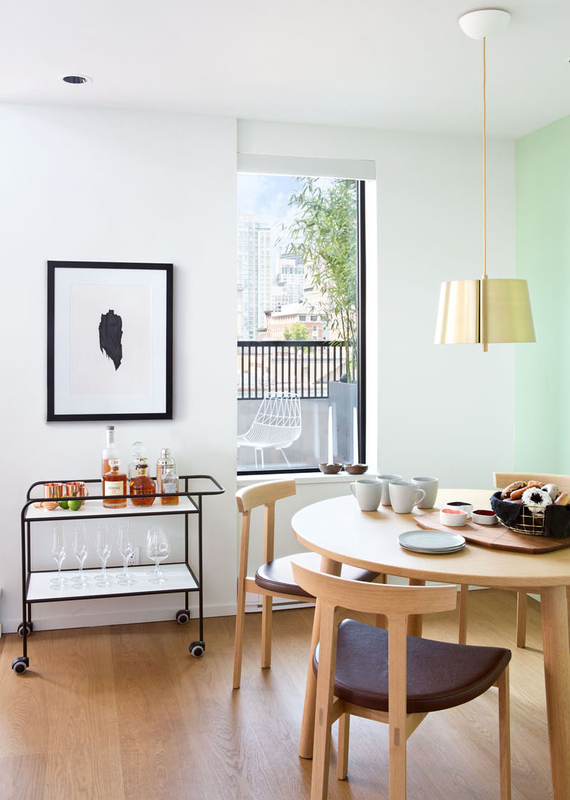 The dining room at the Three-Level San Francisco House is highlighted by the small frames at the wall near the dining table. Its grey pendant light is also charming and very modern. 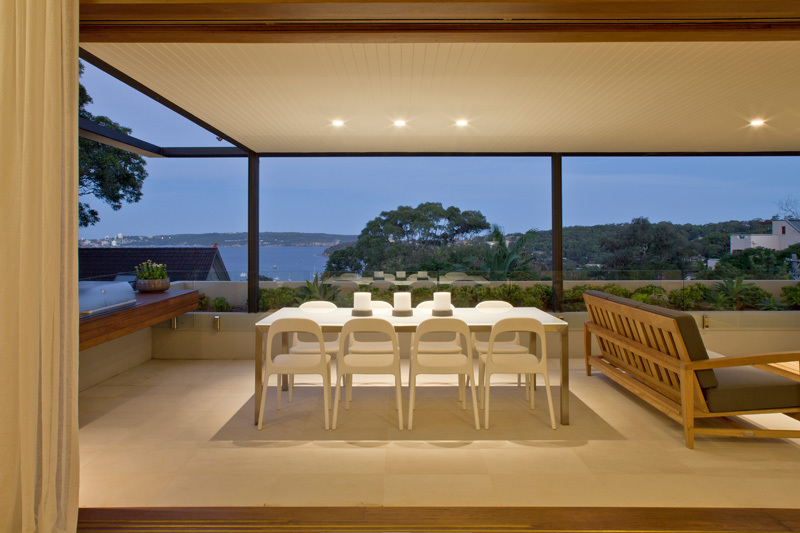 This dining room in Sydney is formal and modern with open views of the sea outside. The chic and elegance of this dining room at a Duplex Apartment in Phoenix is definitely eye-catching. The blue cushions of the chair stand out among the white. 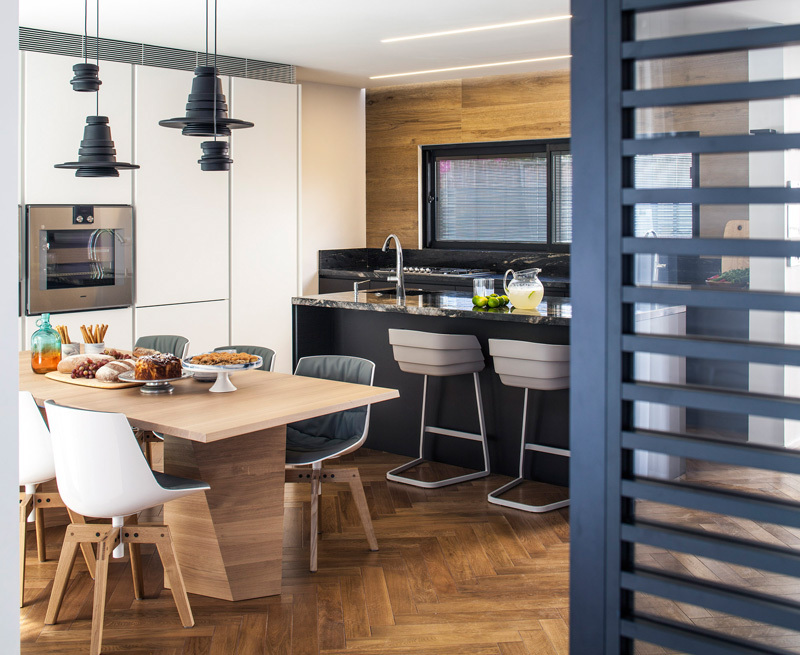 We love how sleek and modern this dining room at a Split Level Apartment in Cyprus is. 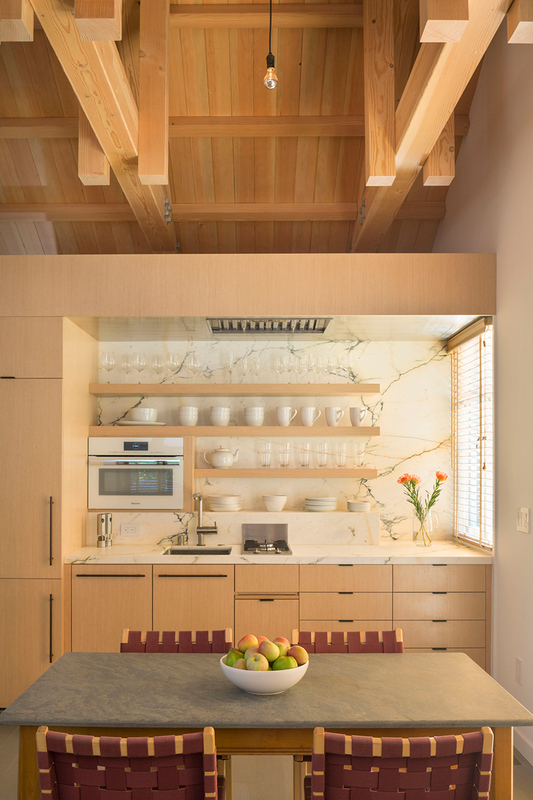 The white marble of the room and the white pendant light brightens the room. 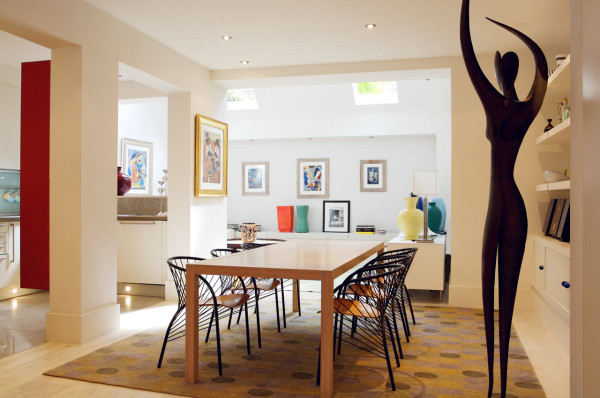 The artistic design of this dining area at the Ruston Mews is very eye-catching. The dining chairs are pretty, not to mention the sculpture of a woman at the corner makes it a room with a personality. The cute printed chairs of this dining room are subtle and can fit into any themed room. The high-backed chairs in this dining area add an elegant look to the room. Not to mention the minimal and abstract photo displays at the back. The room’s wood tables in the chair are charming and homey. Its simple black framed bar cart is also very handy and can be moved anywhere. 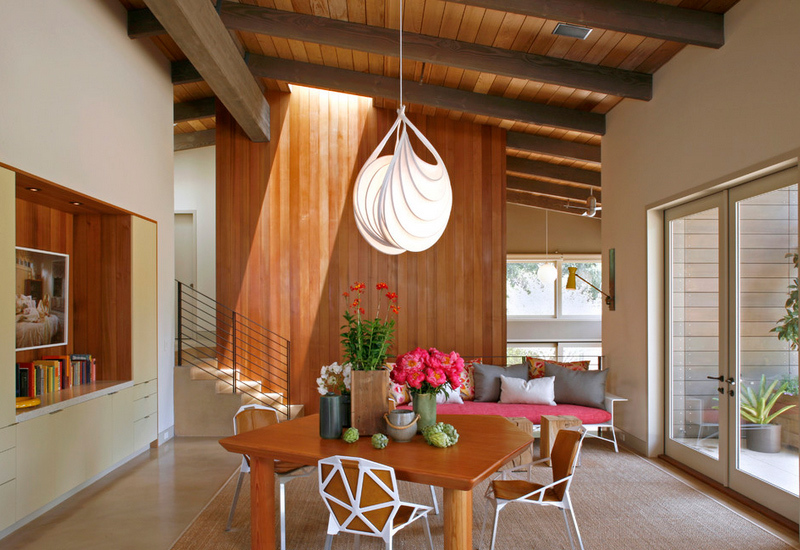 The pendant light above the dining table looks like a star bursting and makes the room very eye-catching. The table also has some storage books for recipes and the like. 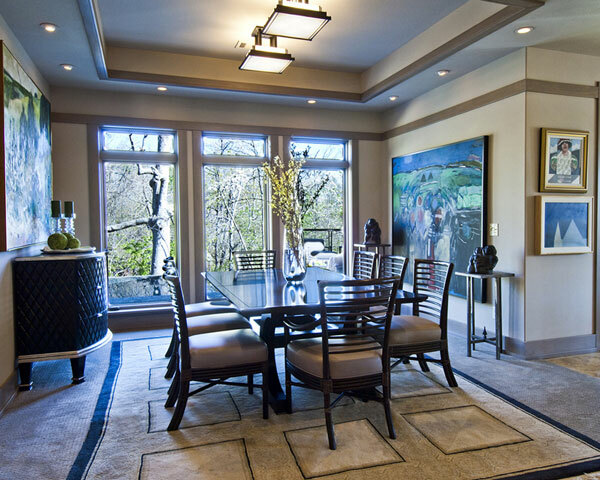 The Lahaye Residence dining room is very contemporary and elegant looking with the two candelabra as centrepieces. Rush Hill Road’s dining space is very airy (with its open ceiling) and white walls. 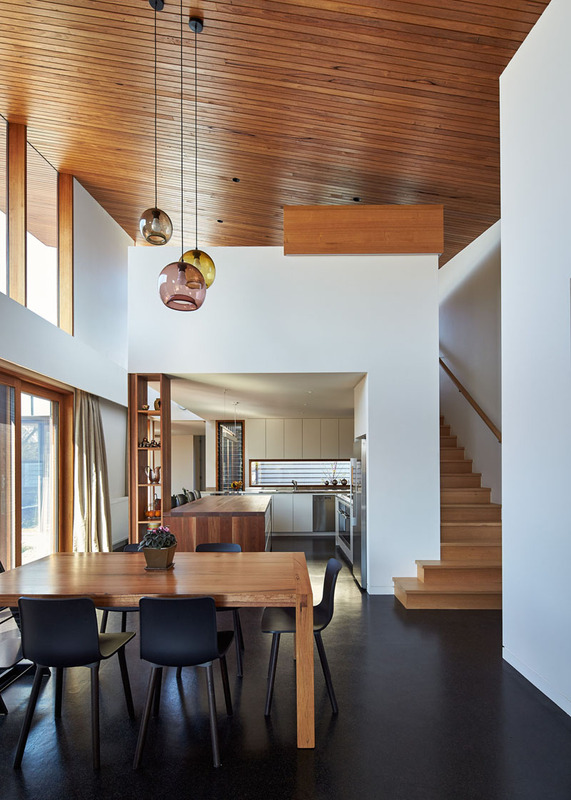 The dining room at the Mid-Block Contemporary House in Australia looks comfortable with the warm brown tones of the room. 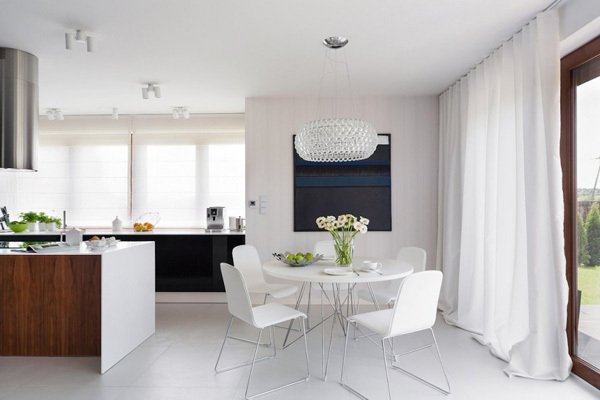 The dining space looks elegant and chic with its silver and white colours. The chandelier also adds a great look to the overall interior. 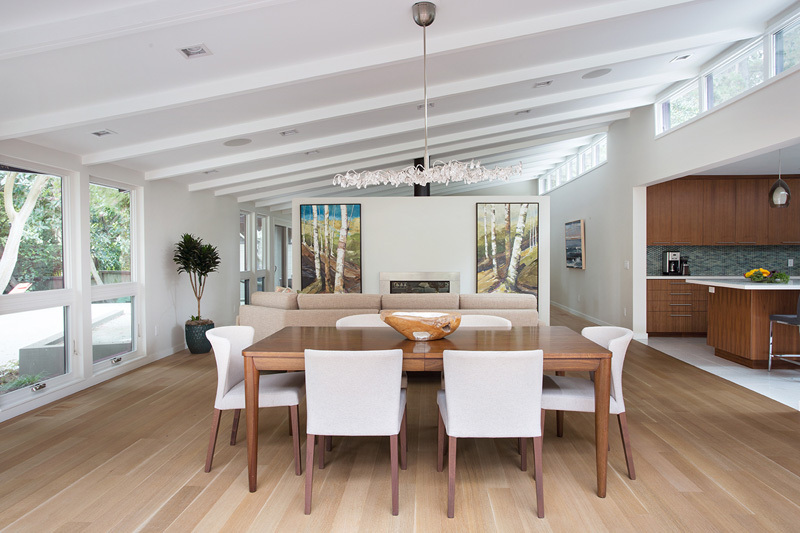 The long table at this dining area at the Hamptons Residence is perfect for seating guests and large groups. Its open walls are also beautiful. 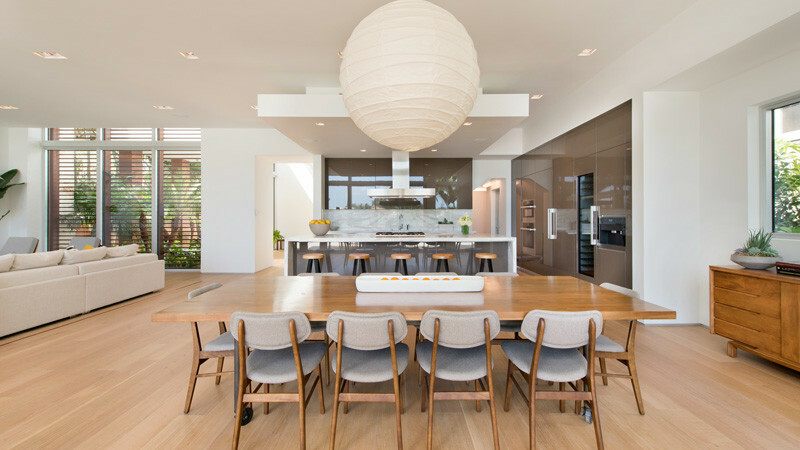 This dining space is very comfortable with its plush cushions and light colours. 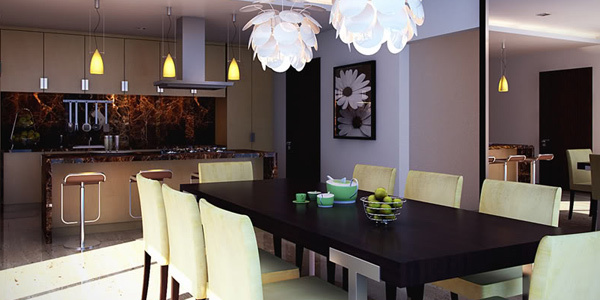 The large sculptural pendant light of the dining table is very eye-catching. The chairs and table look great too. 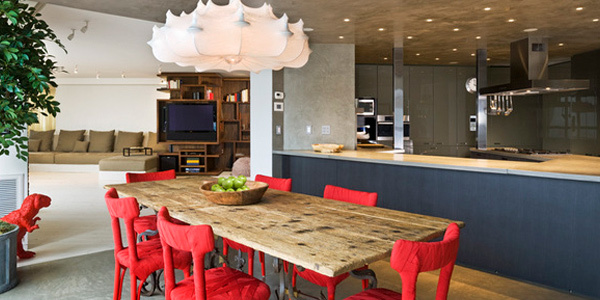 The colourful pendant light of this dining space is pretty cool. We also like the fact that the dining room opens to the backyard. Who wouldn’t love such peaceful views of the ocean? This dining room looks spectacular and very relaxing. 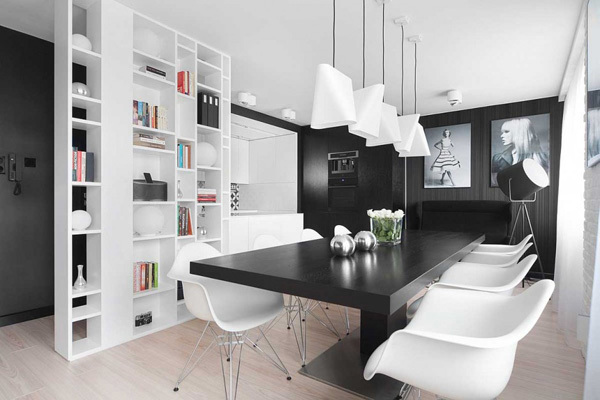 The dining space in this room looks elegant with its dark pendant light and white chairs. If you need great ideas for minimalist dining room designs, below are some great options for you! This dining space from Bell Henry is rather charming. The window at the far end looks great and gives a wider visual space to the room. The room is quite minimal with only simple decors on the wall is visible. 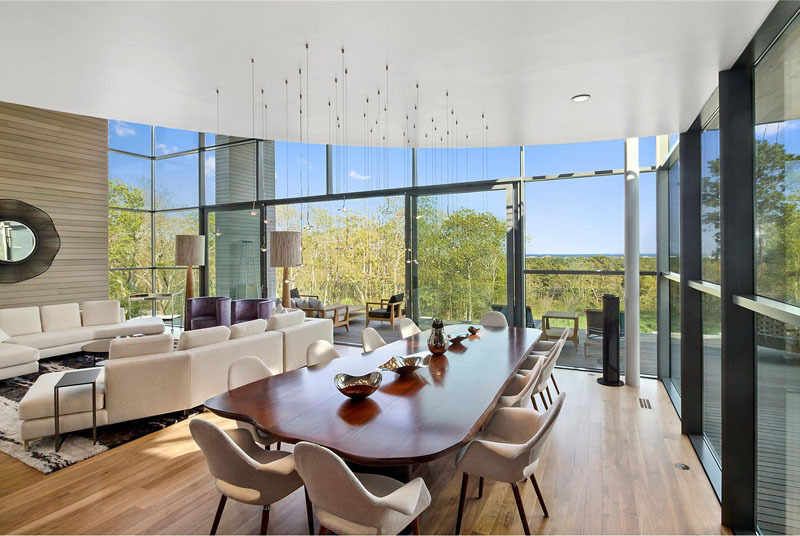 The floor-to-ceiling windows also take advantage of the view outside. 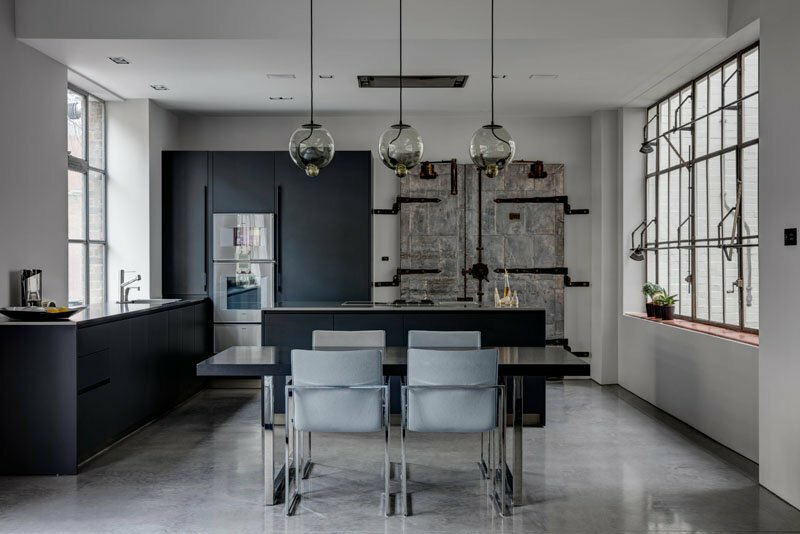 The grey fabric chairs look great with the overall interior of the room and look very minimal too. 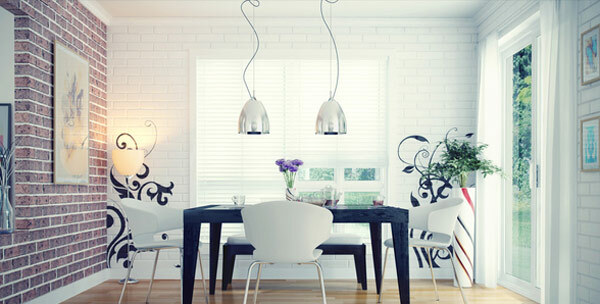 The dining room looks very stylish with its white chairs and black table. 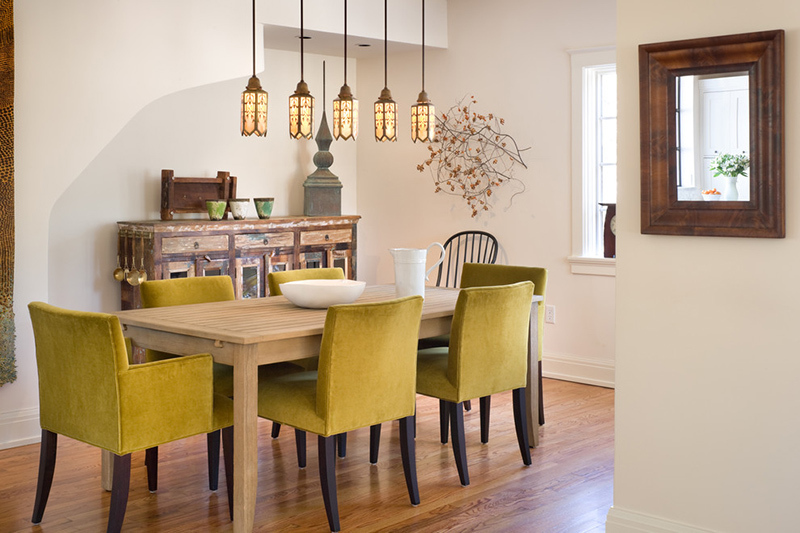 The pendant light arranged artistically rather adds a cool appeal to the dining room. 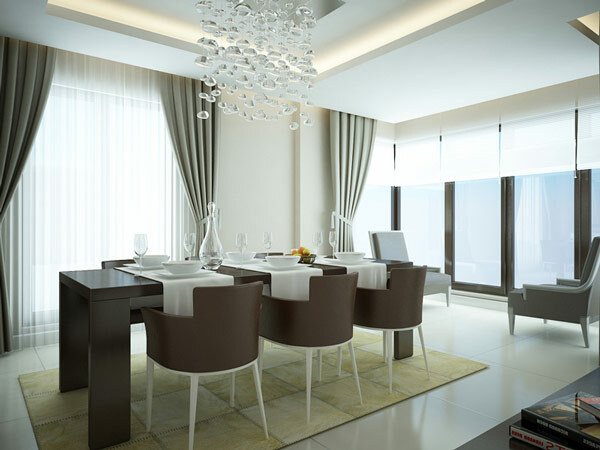 This dining space looks very clean an elegant with its lighting shaped like a spotlight. 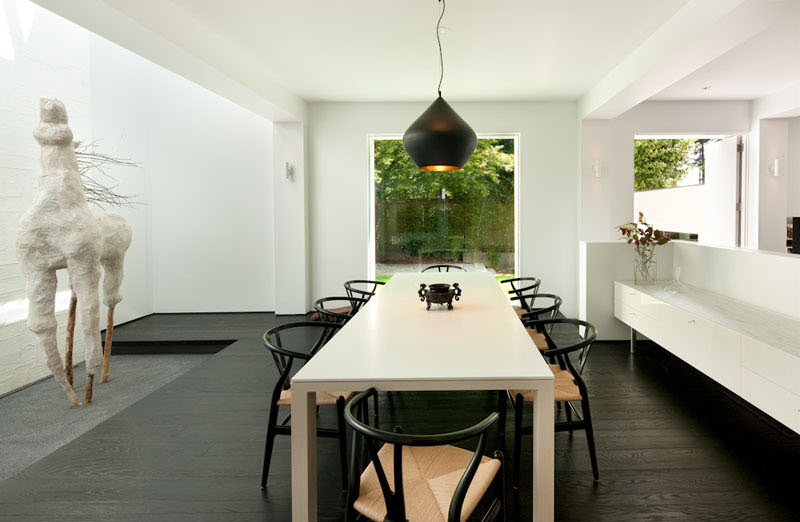 The modern and minimalist look of this dining room perfect for airy and open ambience. The unique set-up of the dining room is quite charming. It allows standing space for preparing meals. 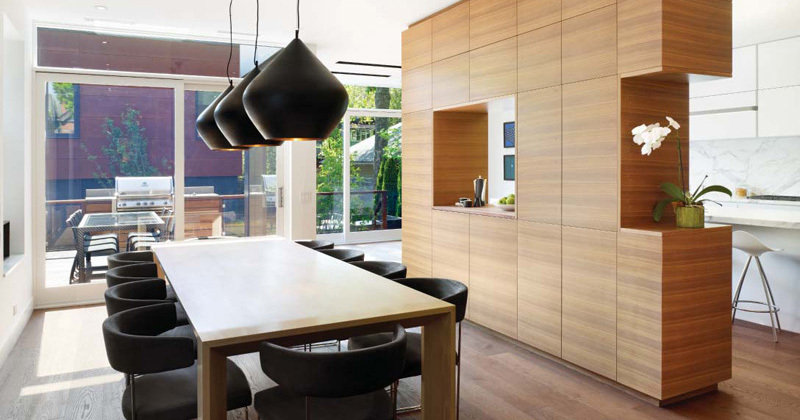 The sleek and stylish design of this dining space is admirable. 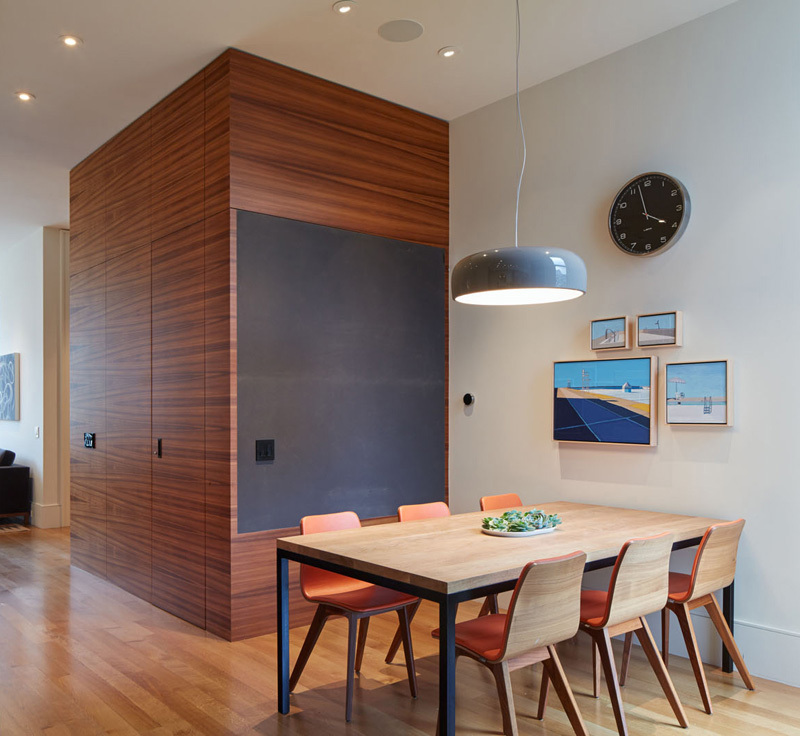 The dining table fully compliments that walls and the countertop with its brown colour. The chairs are also cute and very chic. The dining table’s marble-like material is charming. Plus the chairs are made with woven material. It adds a unique look to the dining room. The mismatched chairs are rather artistically chosen in this dining room with its clean and unique design. This dining room has green comfy chairs. Its pendant light looks cute too with its Asian-theme. 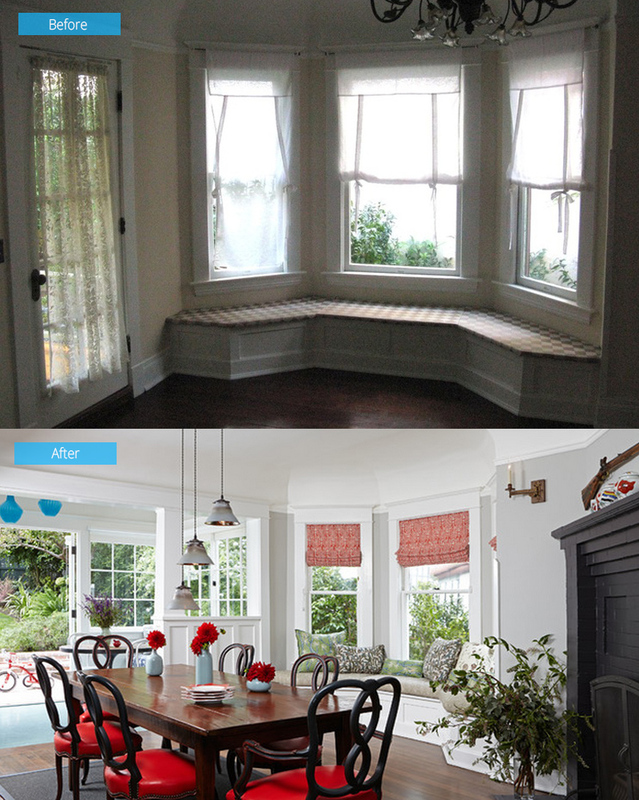 The renovated dining room of the Luxe Family Home looks charming with its red-cushioned chairs and bay window and window seat. The elegant design of the chairs adds a classy ambience to the room, not to mention the fern-like centrepiece blends all with the green motif. 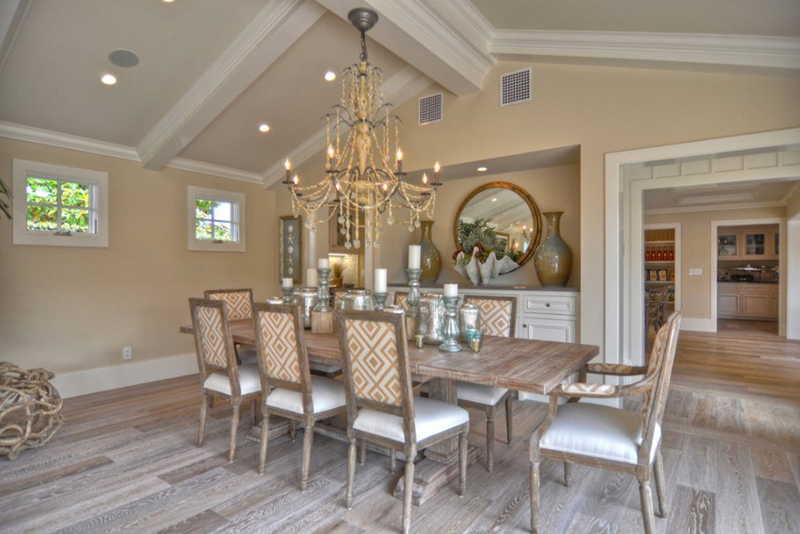 This classy dining room looks very chic with its white driftwood-like chandelier. The colourful rug also adds a splash of colour to the room. The casual yet glamorous design of the room makes it appealing. Its homey tones look very comfortable too. 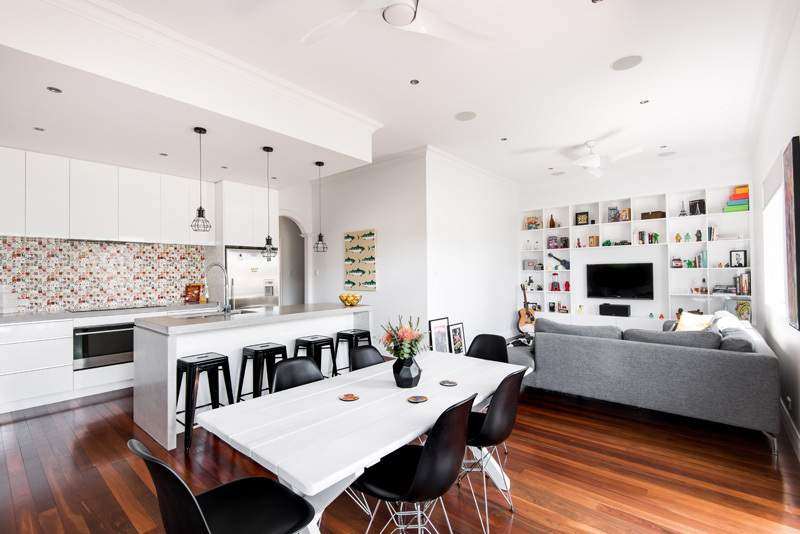 The high bar stools of this https://homedesignlover.com/dining-room-designs/wooden-dining-rooms/room look spectacular with the high dining table and cute lighting at the centre. The interesting combination of the chairs and the table in this dining room at the HoF Residence is quite charming. 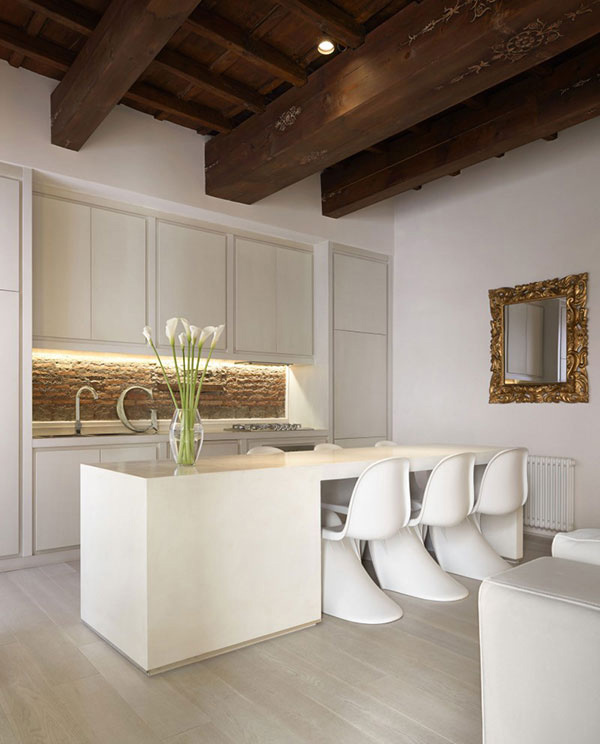 The charming combination of the chair, table and the pendant light in this room looks admirable. The dark colours of some areas in the room are balanced by the silvery colour of the dining chairs. We love the green and earth tones of the room. The edgy and earth-friendly theme is very unique. The cute lightbulbs as lighting to the dining area are very unique. It compliments the black and white motif of the room. 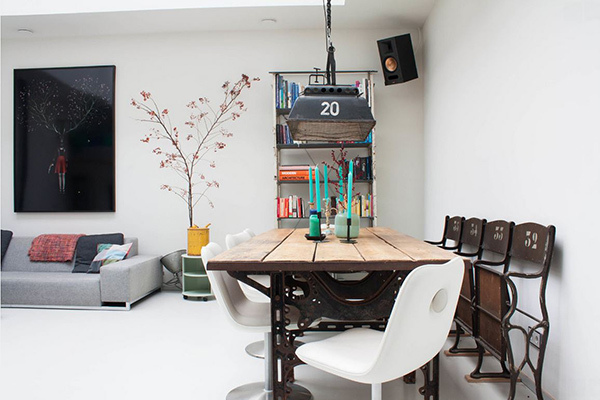 The vintage and industrial feel of this dining room are very prominent. 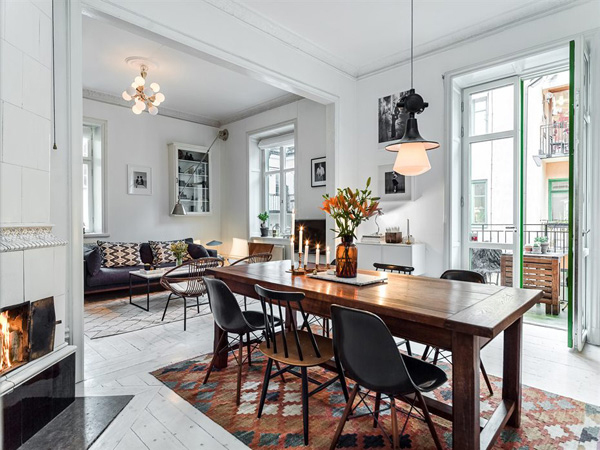 Its unique combination of table, chairs and the vintage skylight is stylish. 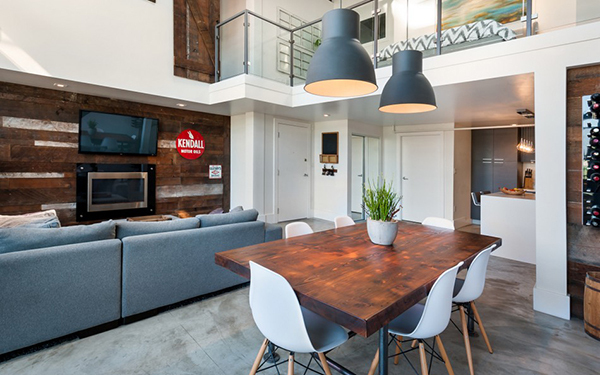 The edgy look of this dining area with high ceiling is very homey. 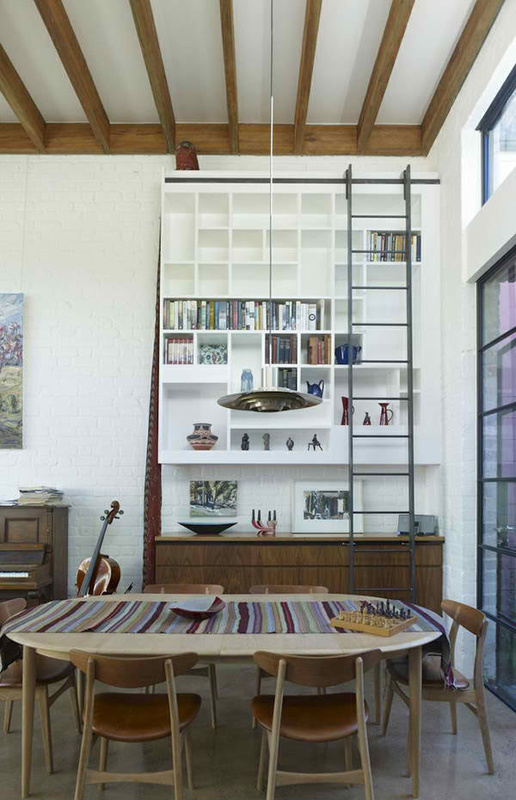 The high shelve with its ladder adds a nice decorative touch to the room. 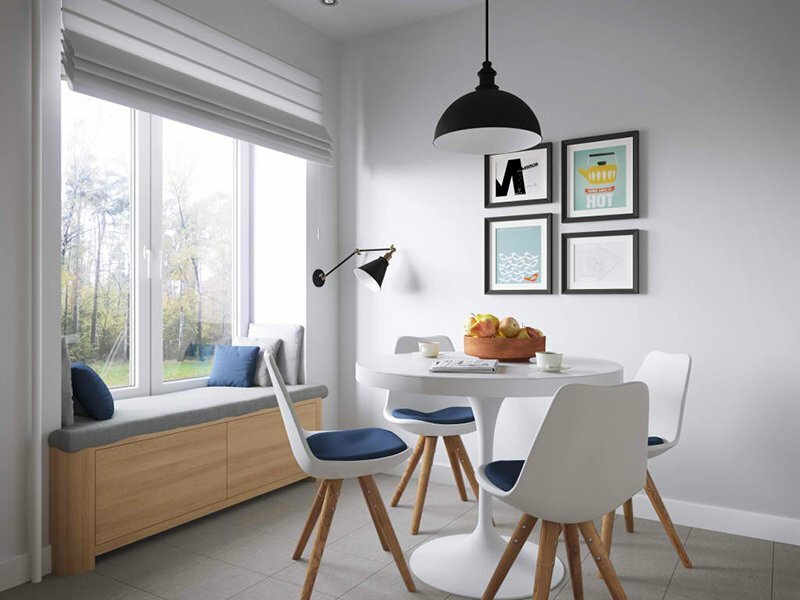 The dining table and its mixed chairs look charming and blend well with the overall room design. 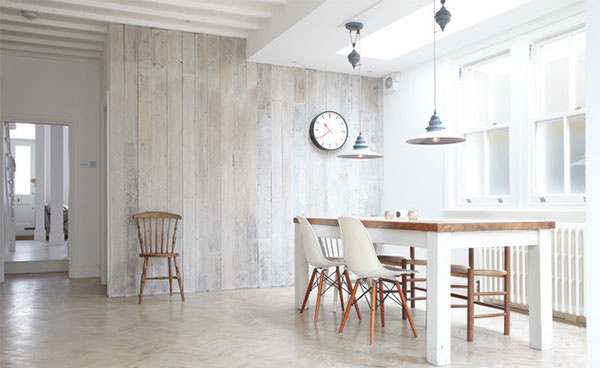 This dining space looks great with its woody and industrial lights and table. 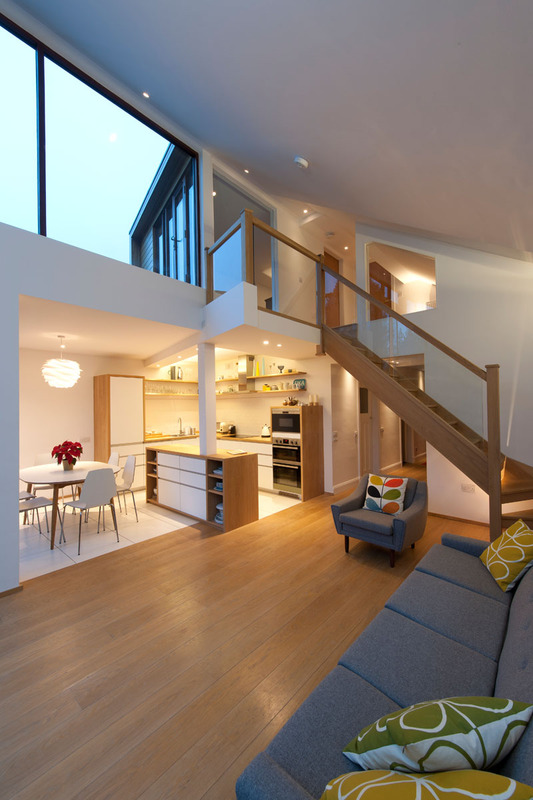 The geometric lighting at the centre of the room gives a splash of colour to the otherwise subtle hues of the interior. The woody accents of this dining room interior are quite refreshing and are complemented by the grey and grungy colour of the wall. The cute centrepiece of this dining table looks charming and is a good conversation starter for this room. The table is quite spacious and the area opens to deck. The retro revival theme of this dining room is very charming. Its brown hues are also combined with green colour for some parts of the wall. The lovely and calming colours of this dining table accentuate the lovely brown and white colour of the interior. 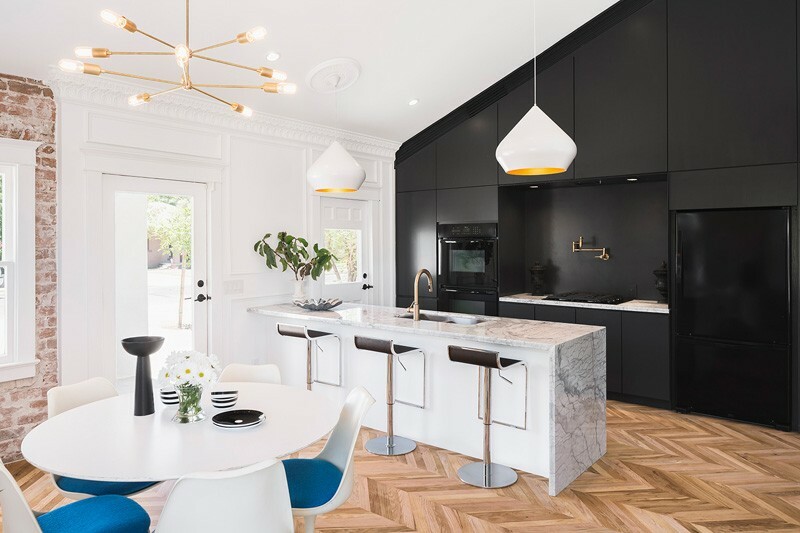 The sculptural lighting fixtures of this dining space are very trendy and brighten the room together with the white colour of the chairs. 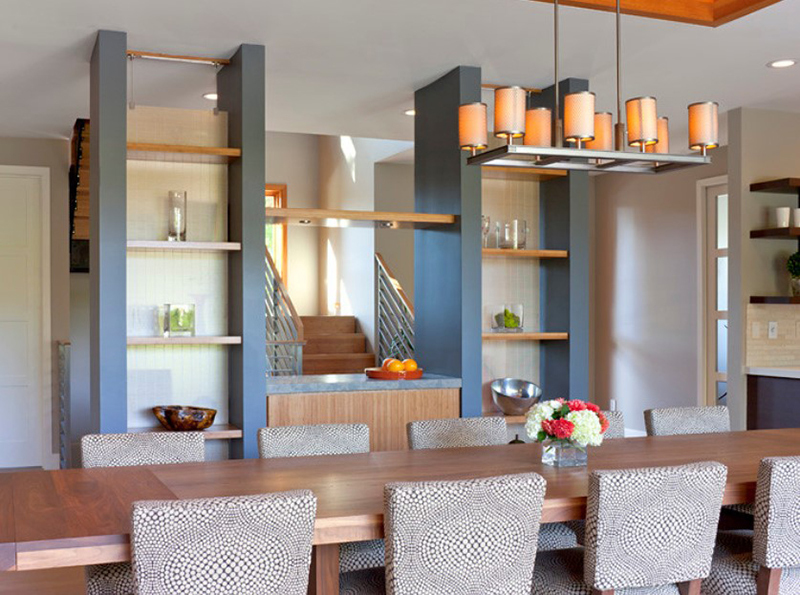 The geometrical and unique style of the lighting fixture adds a charming look to this dining area. Not to mention the classy combination of the chairs. This dining space looks classy with its rustic chairs and white table. The furry lighting at the centre adds a stylish touch to the interior. 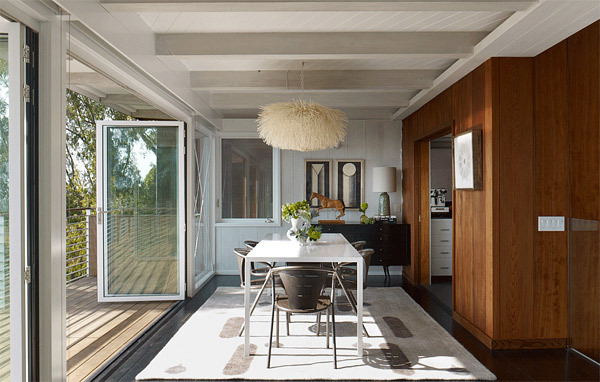 Scandinavian designed dining rooms are pretty great too. And has a unique charm to it that you might like. Below are some cool examples. We like how clean and light this room looks. 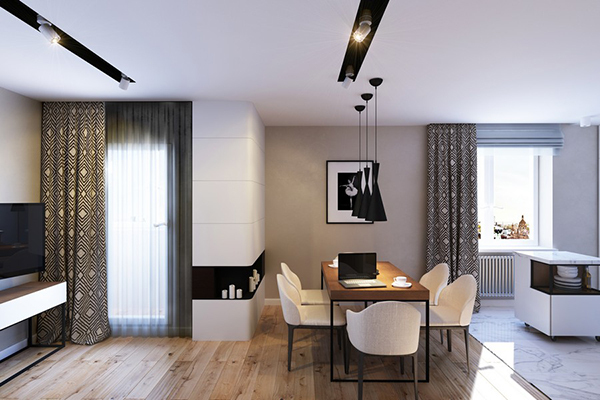 The charming 4-seater dining table looks stylish and is complemented by the black pendant light. This 6-seater dining table compliments the over-all interior of the house. 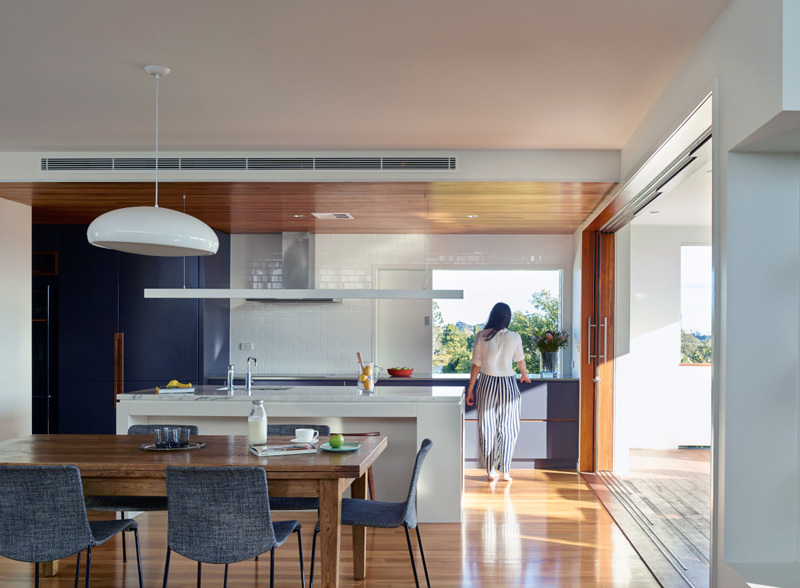 The simple dining room is separated into the kitchen by a nook at the centre. 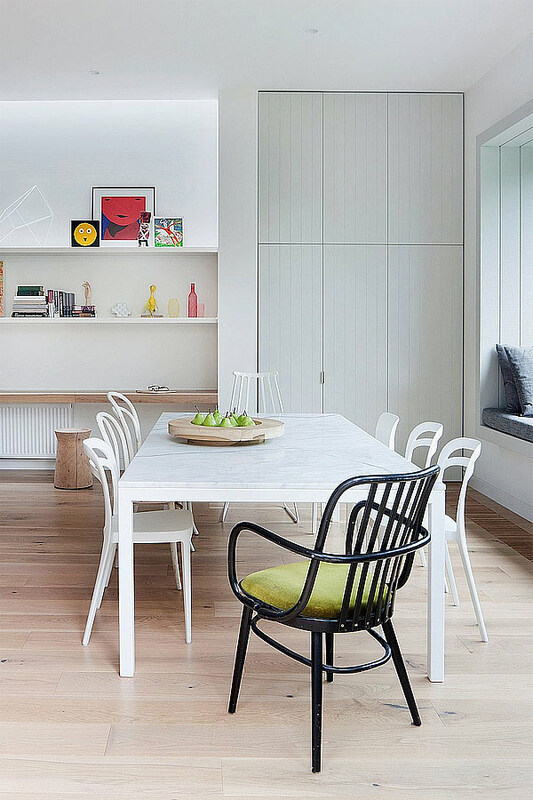 The charmingly mismatched collection of the chairs in this dining table looks stylish. The colours are subtle and refreshing to the eyes. 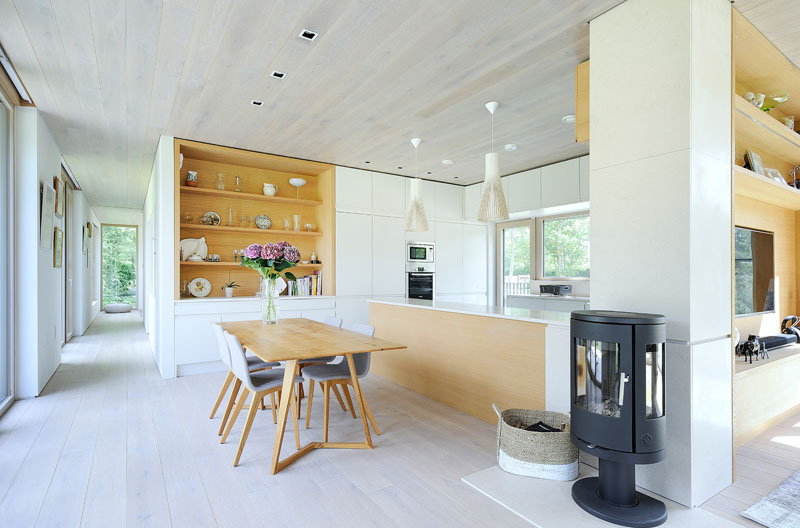 The stylish combination of wood and glass works well with this dining space. The painting on the wall also adds the splash of colour to the room. 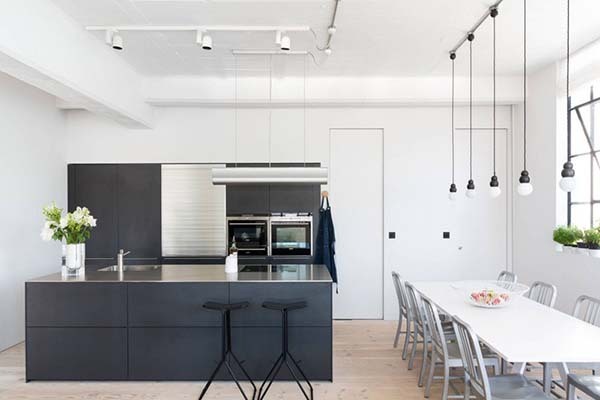 The black colour of the chairs and the pendant light adds an amazing appeal to the whole interior. The patterns of the colourful rug are also in sync with the colour theme. The rustic and charming appeal of this room is nice and stylish. The bare walls and charming windows add a good backdrop to the simple dining set. 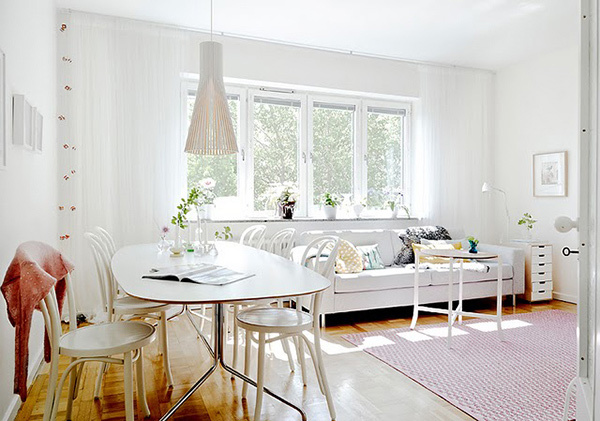 The dining room is pretty chic with its cute lighting and white colour that works well with the rest of the room. 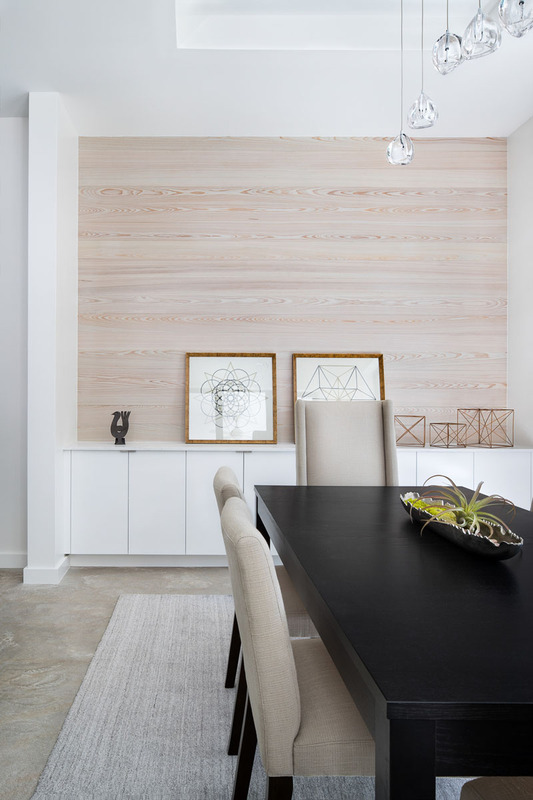 The dining space in this room looks amazing with its wood material. 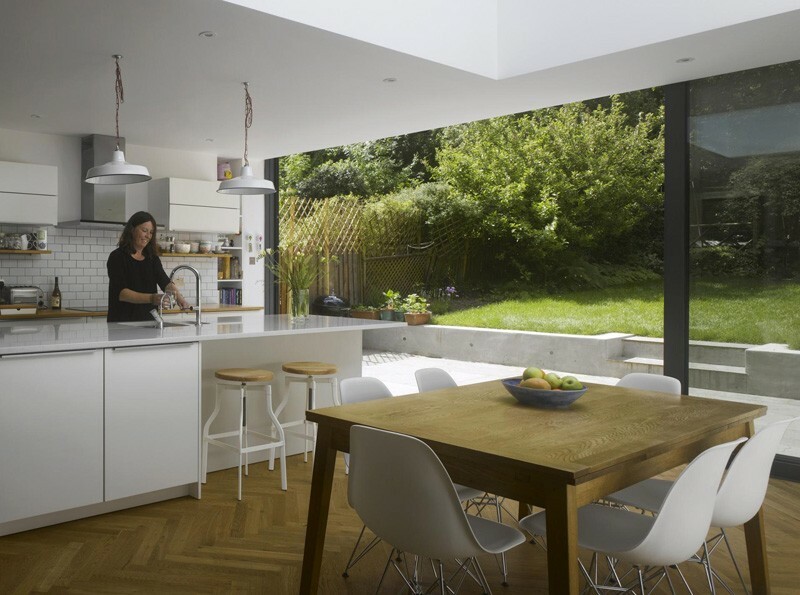 It has open views of the backyard too, allowing light and colour into the room. 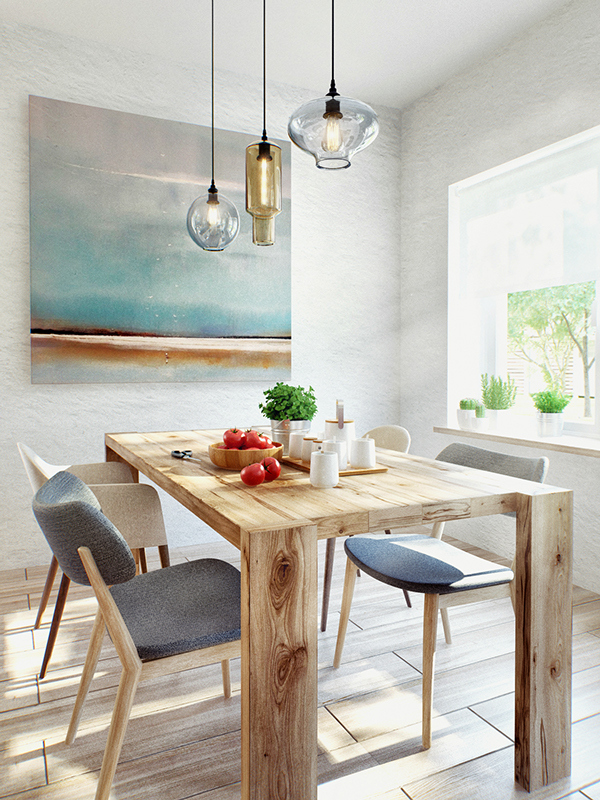 The dining table’s unique pattern on wood works well with the rest of the wooden elements in the room. The chairs are rather stylish too and jive with the centrepiece and the pendant light colour. Still, haven’t found a design that you like? Here are some more designs for you! 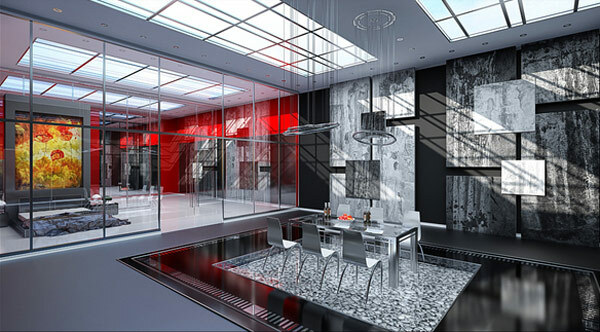 The design has been rendered using VRay and 3d Max 2011. 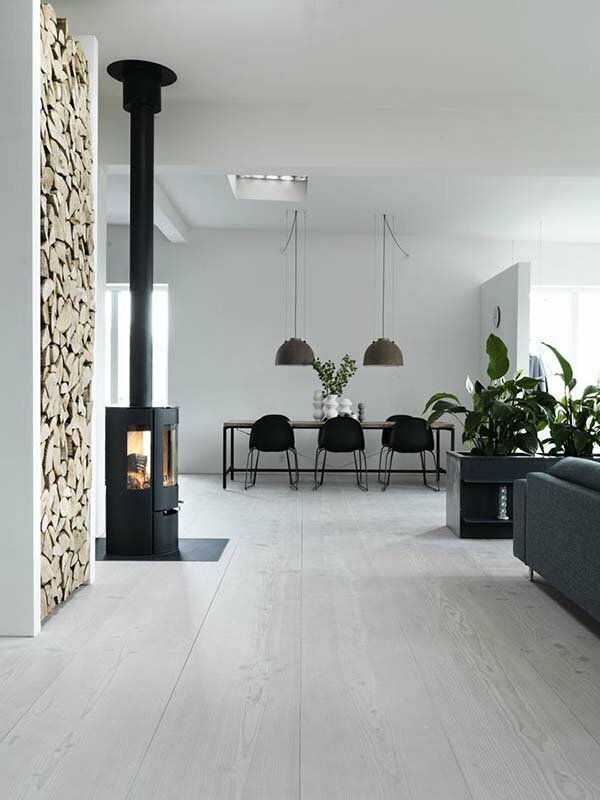 This room looks pretty cosy with the fireplace as the focal point of the area. 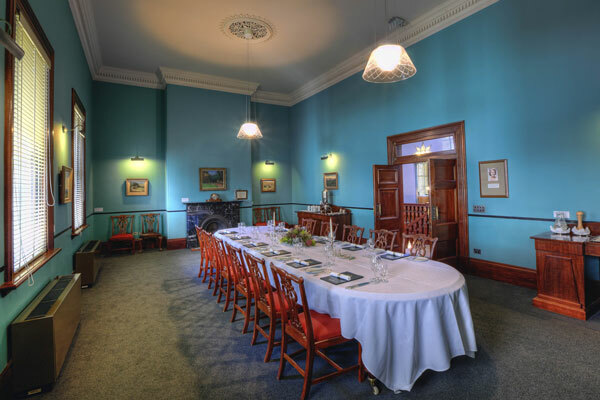 This photo of a dining room has been taken at the Customs House in Brisbane. The room is softened and brightened by the lamps and lighting in the room. 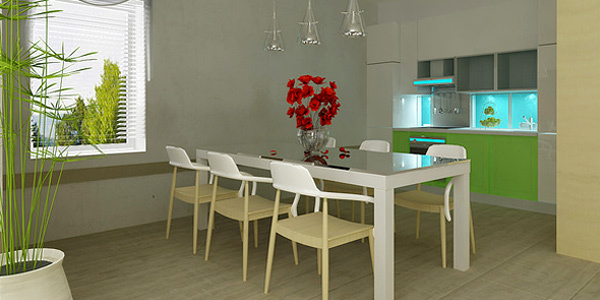 This dining area design has been modeled on Maya 2010 for Windows XP and 7 although rendered on Maya 2010 for Mac. The designer has used swirly patterns on the wall and on the lighting. It adds a rather cute and charming look to the room. The design has been done on Cinema 4D with a minimalist design. 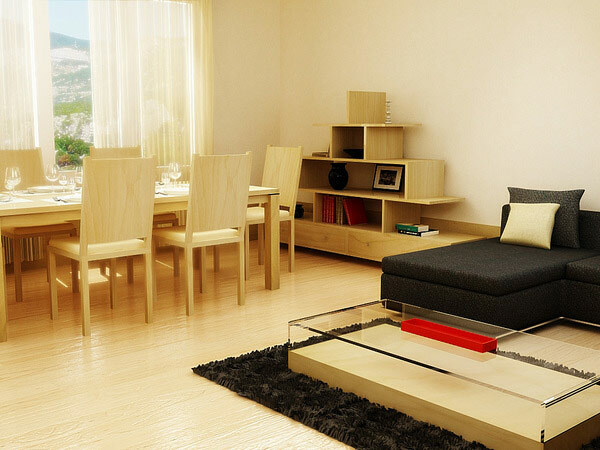 Its bare walls and minimal furniture makes the room classy and elegant. The dining area has made to look simple yet elegant. The large mirror on the wall magnifies the space making it look bigger. The light in the middle of the dining area adds life to the whole dining area. It’s light to make the room look warmer. The photo shows the accurate use of colours in curtains and the types of furniture as well. Its open windows makes the room airy and very pleasant for long conversations. The dining area design shows a newest revision for Ibu Otty. The room is located in Sunrise Garden, a private residence in Jakarta. Its warm gold light at the corner of the dining area does mimic the sunrise colours. 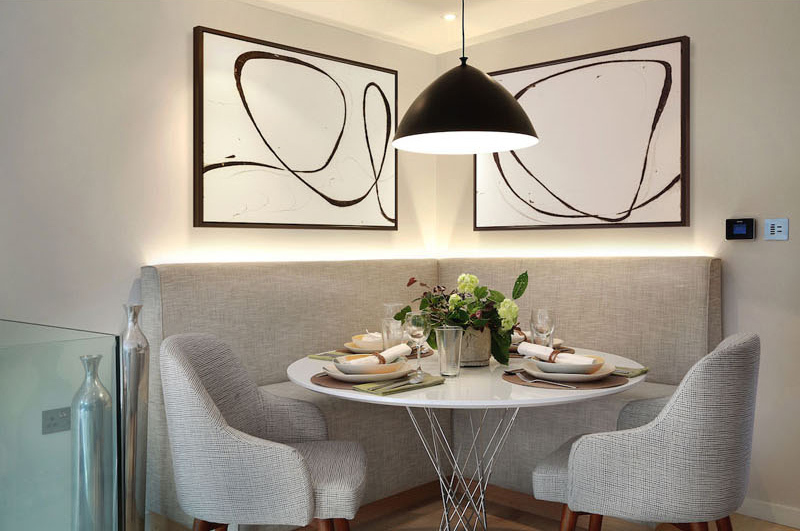 The designer has chosen to design a modern contemporary dining area with a classic touch. This shows a closer look of the dining area. 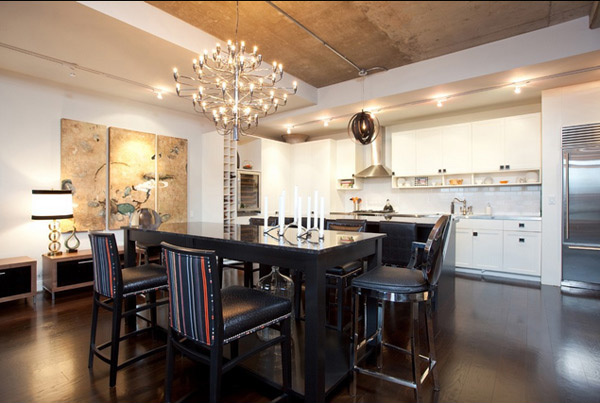 The double chandelier at the centre of the table adds a cool personality to the room. 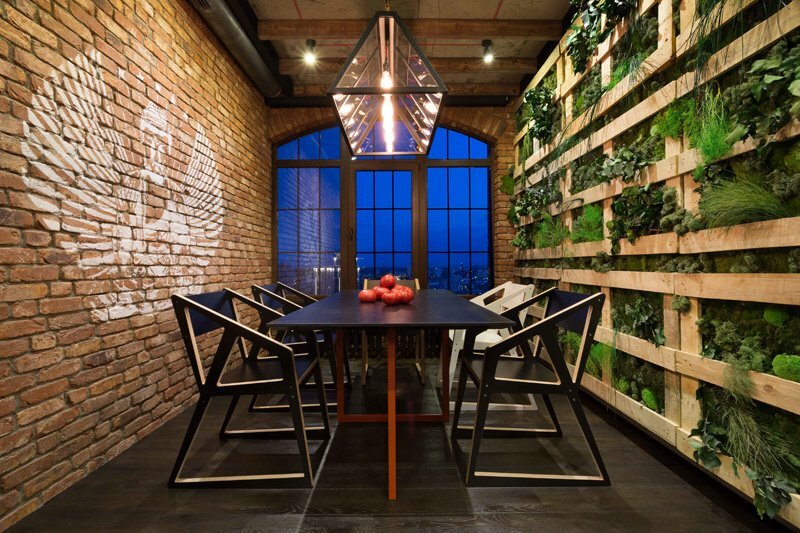 There have been recent developments in the designer’s projects and this includes this green room dining style. The green wall adds a nice touch to the room as a whole. 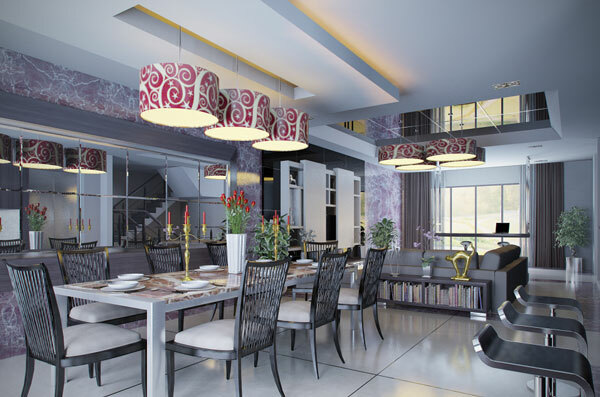 This dining room design ideas has been created for a residential interior project. The chairs and table blend well with the warm and earthy colour-theme of the room. 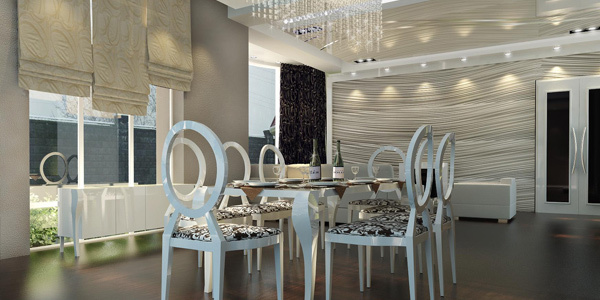 A modern contemporary dining room design. The open-glass of the roof reflects the light outside. Just imagine dining under the stars here! Plus the unique wall painting adds a personality to the room. This dining room project has already been built and has a rather grungy yet artistic look. The glass on the wall and the table adds a futuristic feel to the room. 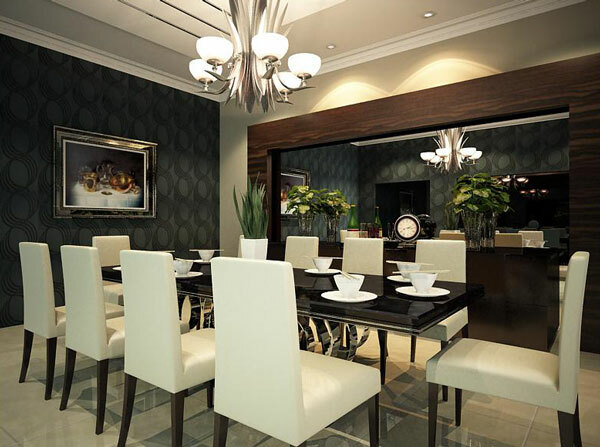 An example of a modern dining room design. The room looks very elegant with its grand chandelier and minimal look. 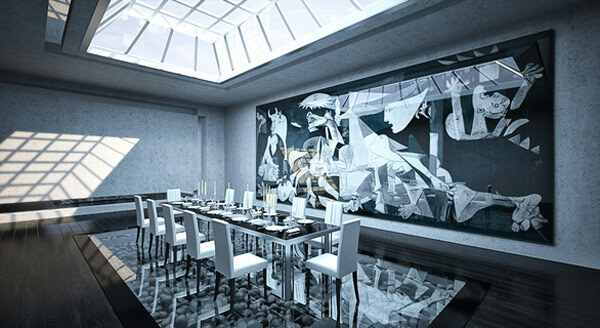 A Dining Room rendered using 3ds Max. The dining room is small yet it looks cosy enough for a nice dining experience. The above photo shows another angle of the whole design. 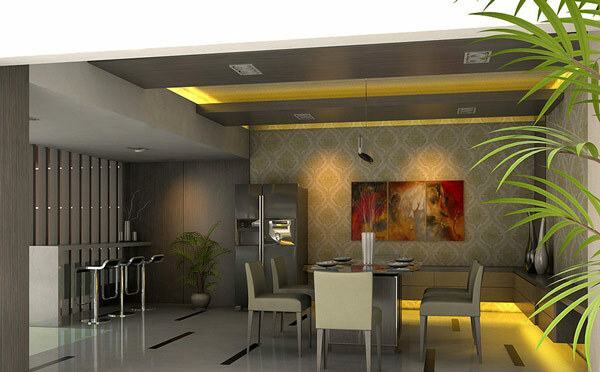 The dining room design is a product of an interior rendering project. Its open window allows natural light to come into the room. 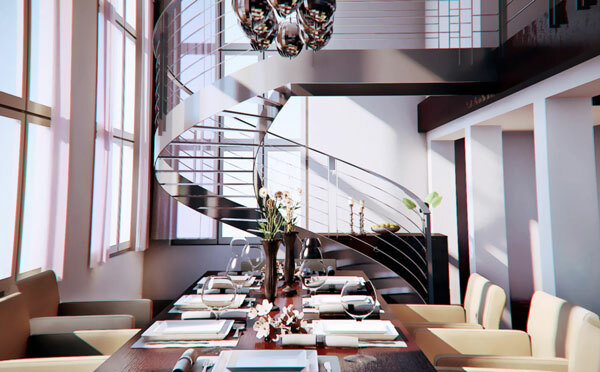 The chandelier compliments with the silver-coloured stairs. 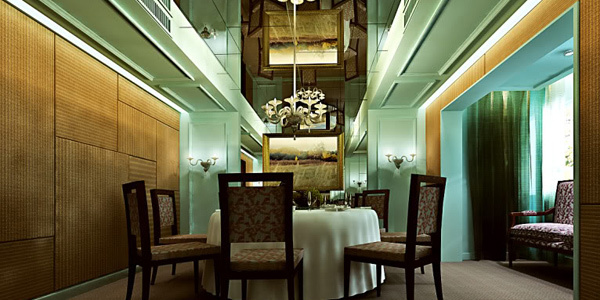 The designer has changed some items in the design thus showing another style of a dining room. 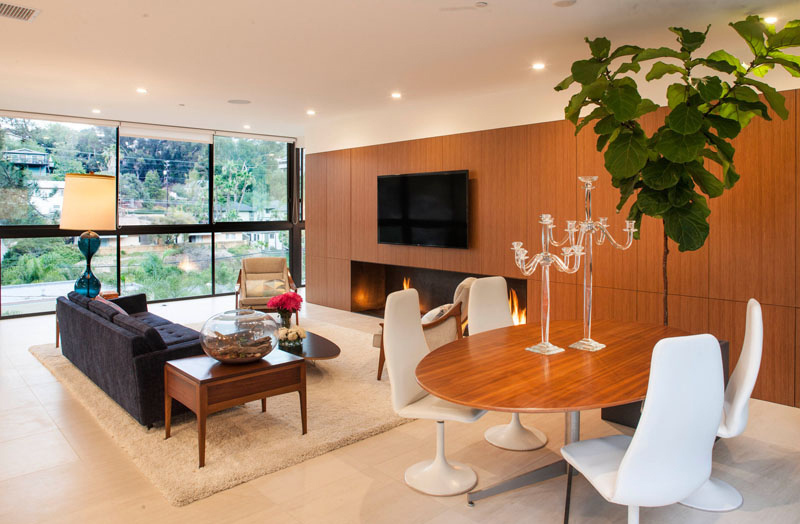 Its elaborate floral pattern on the glass wall adds a great focal point to the room. The glass also makes the room look bigger and very classy. 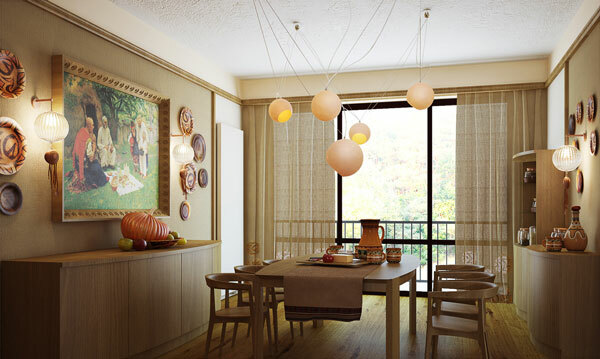 The dining room design is National Ethno inspired. Its oriental design makes it charming and very comfy. The chandelier has a personality of its own too. 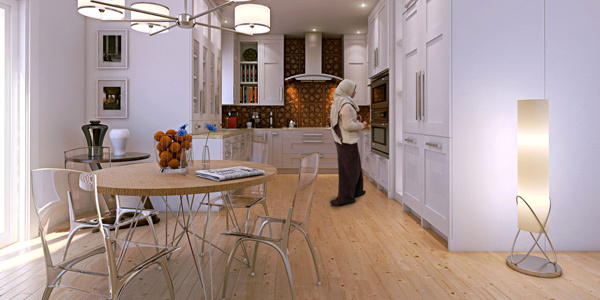 3D Max 2008 and Vray has been used in rendering the design. The chairs and table accessories in the dining room combine well with the whole interior of the room. 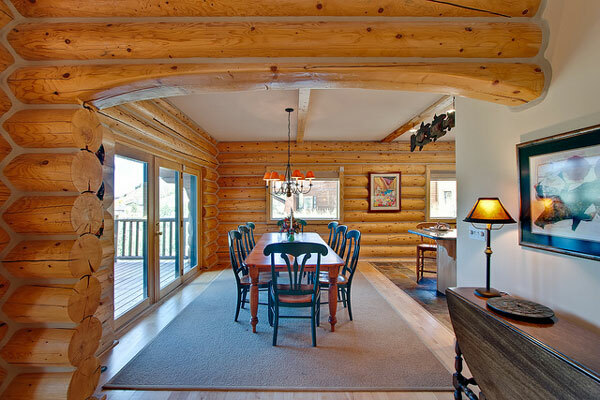 A capture of a log-styled dining area. This wide room shot aims to capture the arched log entry. The dining room is located near the glass-doors which give it a nice view of the outdoors. Its simple dining table and chairs compliment the log walls. It matters when you get famished yet it also matters to be sensitive enough when it comes to designing your dining area. The choice of chairs, the table and even the wall decorations affect the ambience of the whole room. But we sure hope you were able to come across a design you might like to apply to your plan for a dining room. Our house is just a simple one and it’s all white. Thank you for sharing a design by sharadhaksar. That’s a dining room i’d love to have in the future. The log dining room looks very homey!